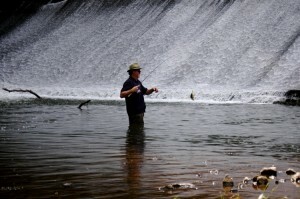 Almost all I know about fishing I learned first in East Tennessee mountain streams. 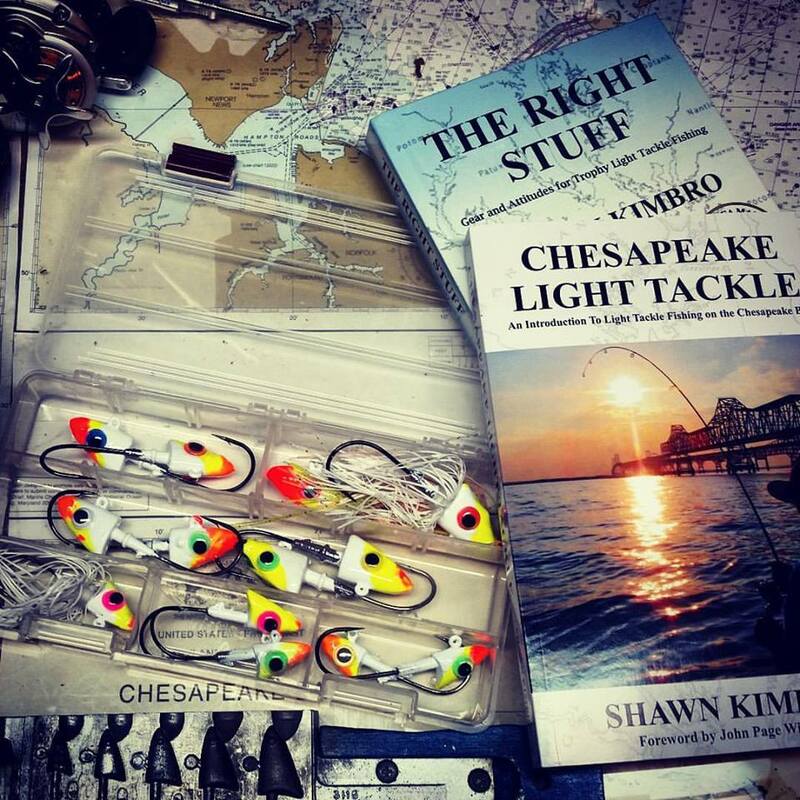 Tactics like swimming a lure with the current, casting to the deep side of cover, matching the hatch, looking for the dark water, minimizing terminal tackle, and the importance of stealth are all stream fishing techniques that translate easily to fishing in the Chesapeake Bay. As much as I love the Bay and targeting the many species that live here, there are times when the call of the creeks is so great that I have to drop everything and go. Today was one of those days. It might sound odd to anyone not familiar with the area, but the Appalachian Mountains are less than an hour away from our home here on Kent Island. In two hours, I can be across the primary backbone of the Blue Ridge and into the Shenandoah Valley. The Potomac and Susquehanna rivers, which are the two biggest tributaries to the Bay, are essentially mountain streams. 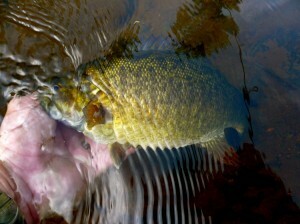 Both rivers are loaded with smallmouth bass, walleye, trout, and multiple species of panfish. One of the pleasures of living in the Mid-Atlantic is that there is excellent fishing of many different types in every direction. This morning, I talked Dianne into joining Crockett and me on a short jaunt up Interstate 95 and Maryland Hwy 24 to the upper reaches of Deer Creek. I’ve fished Deer Creek before, but always down closer to its mouth at the Susquehanna river near Harve de Grace. This time I wanted to follow it back farther into the hills. Our first stop was a county park near an old grist mill. Even though it’s a holiday weekend, the area wasn’t very crowded. There were just a few picnickers scattered here and there. I waded in just below the mill dam and started casting a tiny Rebel crawdad. I was rewarded immediately with a fat little sunfish. Subsequent casts brought in smallmouth bass and more brim. The fish were not very big, but hooking them in the fast clear water was every bit as thrilling as landing summer rockfish in the Bay. After about an hour we decided to drive on upstream a few miles along a dirt road where we eventually found a trail leading into the woods on the northern side of the creek. 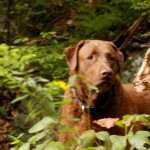 Crockett and I waded and fished while Dianne hiked and took photos of late summer wild flowers. 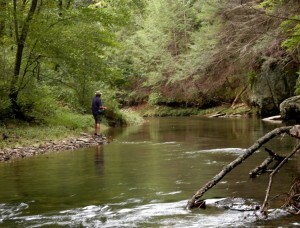 There were more smallmouth here, along with hundreds of creek minnows that we called hornyheads back in Tennessee. Even though it’s less than forty miles from Baltimore, it’s obvious that the little creek doesn’t get fished too heavily this time of year. We never saw another person along the trail. The only tracks I noticed on the river bank were from deer, muskrats, and beavers. 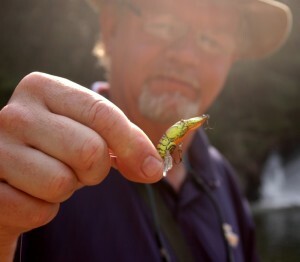 I’ve learned from stream fishing back in the hills that a good sign of a productive creek is when you see minnows following your lure downstream. I saw two, three, sometimes as many as a dozen small fish chasing my crawdad on virtually every cast. If I paused the retrieve even for a second, I hooked a feisty little creek shiner. “Too slow,” I thought, comparing the experience to Spanish mackerel fishing in the Bay when the object is to reel fast enough to outrun the slower rockfish and blues. As I moved on upstream the trail disappeared, but we eventually caught up with Dianne near a pretty little rocky gorge. We paused there for a few minutes enjoying the scenery, then hiked back down the trail to the truck. I was glad to be away from the crowds on the Chesapeake today. I took some friends who live in DC out onto the busy Bay yesterday. 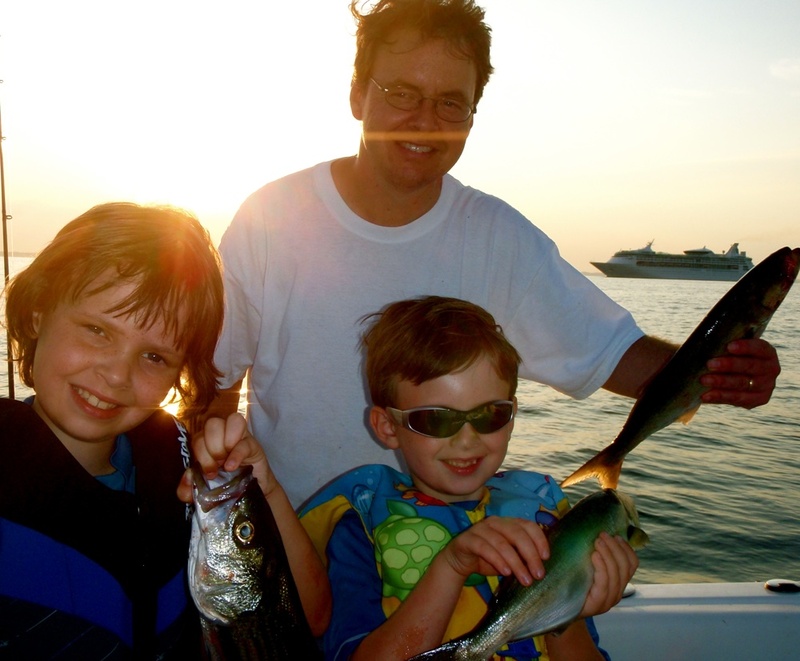 Tim brought his boys Michael and Ryan along, and we fished out of E. Bay for rockfish and blues. Even though there were boats almost everywhere you looked, it was a productive day and we all had a blast. We finished the evening with grilled rockfish and smoked bluefish. So, even though the settings were almost opposite, the last unofficial weekend of summer has been filled with fun fishing. The scenery and tackle may have been very different, but it’s still two sides of the same coin. Fishing is, after all, just fishing. Am surprised there were not more replies to this posting. Couldn’t agree with you more how vast the opportunities are for those willing to do a little trekking in and around Maryland waters. Striper fishing is fairly new to me and I must admit I have the fever. My limited opportunities come in a kayak or small boat with a 10hp motor. My recent passion for striper fishing was born of the occasional 18 or 19″ fish we would catch while fishing for white perch with bait on a tidal creek. A few casting trips with a local guide have further set the hooks in me to try to catch bigger fish with more knowledge, jigs and no bait. I am near 58 and have fished most of my young and adult life from shore or wading fresh and tidal creeks and streams for bluegills, perch, trout, shad, crappie and bass with my dad or a good friend and my two sons. I still get excited when a 6″ bluegill smashes a little broken back Rapala or crankbait from a small pond or overgrown creek bank. My close friends and family have been blessed many times over to be able to share almost pristine fishing conditions throughout Maryland at various times and places without another witness in site to the peaceful splendor that often surrounds us overlooked. Makes me feel smaller than the fish I catch to be a part of it. Many thanks for your book CLT and postings on this website. Both have helped me to experience a new kind of fishing and success with stripers. Looking forward to reading your new book and would like to know if you will be hosting any local signing opportunities.